Frequent Pages users may find it helpful to know how to highlight selections, words, sentences, and paragraphs of documents opened within the app. 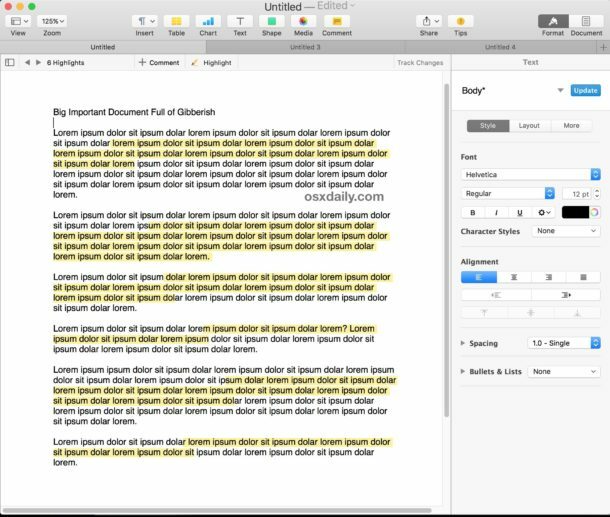 Highlighting is particularly useful for students, writers, editors, educators, and office workers, but it’s valuable to nearly anyone who spends a fair amount of time in the word processing application on a Mac. 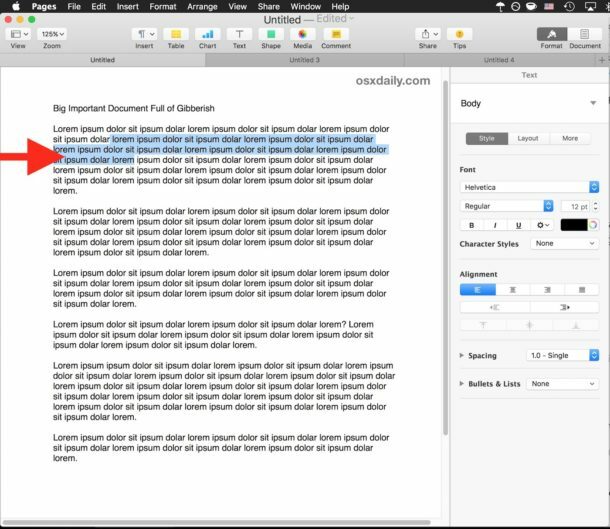 While the highlighting ability may not be completely obvious at first, highlighting in Pages is quite simple and is actually part of a built-in commenting feature that is easy to use and fast to implement throughout documents opened in Pages on Mac OS. 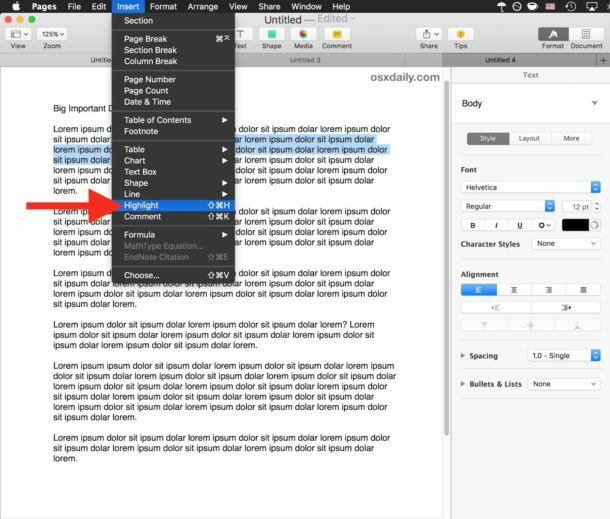 We’ll show you how to highlight in Pages app on the Mac by applying an initial selection highlight, and also demonstrate two different methods to adding additional highlights to other selections if desired. Be sure you update Pages on Mac before attempting to do this, the earlier versions of the app do not support the highlight and commenting feature we will demonstrate here. You can update Pages from the  Apple menu and choosing “App Store” and then going to the Updates tab and finding Pages to update. The selected portion of the document will now be highlighted, with the default background highlight color being bright yellow much like a yellow highlight marker would be. Once you have added a single highlight, you can then quickly apply new highlights by using the comments and highlight bar that appears across the top of the document. To use this, simply select some text or a section of the document in Pages, then click on the “Highlight” button in the bar. You can use any method you’d like to add new highlights to the document. If you plan on highlighting multiple different documents in Pages, you will need to access the Highlight feature in any open document. Thus, whether you have multiple open documents in tabs within Pages or as separate windows, each document must be highlighted with the feature separately. Note that deleting a highlight removes the highlight but does not delete the text that was highlighted. 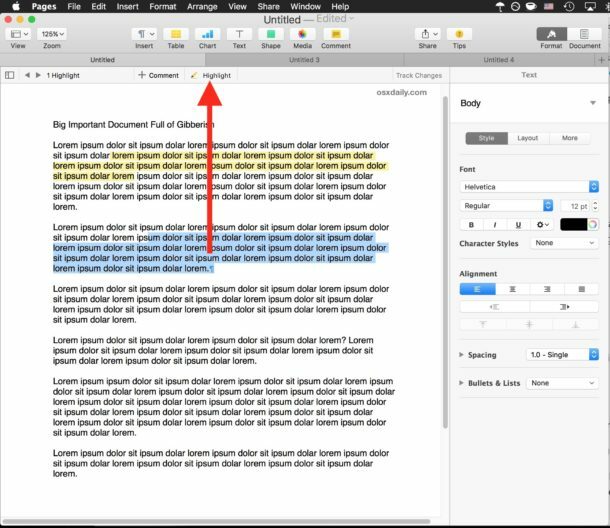 It’s also important to point out that highlighting in Pages is separate from the general feature to select text in Mac OS and the ability to change the general highlight text selection color on Mac is entirely separate as well, with the latter being part of the Mac OS system and not specific to Pages app. Earlier versions of Pages app can apply manual highlighting of selections by changing the background color of selected portions of text. This is a bit more complex than the above easy highlighting feature in newer version of Pages, which is yet another reason why you should update the app to get the latest features. This approach is not necessary on modern version of Pages with newer features and the direct Highlight option. Do you know of another way to highlight in Pages? Maybe there is a better way to highlight portions of a document in the app? Let us know in the comments below! Still sad that the highlight on the Mac isn’t styled to actually look like a real marker, like it was on iBooks for iOS. Always one of my favorite touches. Well, that’s interesting. When I first saw the title of the article in the email I got, I thought it meant “highlight” in the sense of selecting a word or series of words to make changes, and wondered why an article had to be written about that, since the procedure’s been pretty much the same since 1984. Then I see in the article that it’s about something different, which I’ve never had occasion to do. Anyway, I’m still using Pages 4, since the current version is still (last I heard) missing a lot of its functionality. But this reminded me of something that’s an ongoing annoyance in Pages (4; maybe it’s changed in 5? ): that when I want to select, say, a phrase, I double-click the first word, then hold down Shift and click on the last word in the phrase. If you do that in TextEdit, the whole phrase is selected (including all of the last word, wherever in it you click), but in Pages it only selects to wherever I click in the last word. So I have to be very precise to click on the last letter of the last word. I use TextEdit a lot, and am very impressed at its functionality – lots of little things done write like the above. And the fact that TextEdit can work with non-Latin scripts that Pages cannot. Back in the Classic MacOS (i.e. OS 9 & earlier) there was a similar relationship between SimpleText, which could be used with all of Apple’s own Language Kits, and AppleWorks, which could not. It’s like one part of the Infinite Loop wasn’t talking to the other part. Be nice if all Apple’s text-editing software was based on the same text engine (the better one, of course). 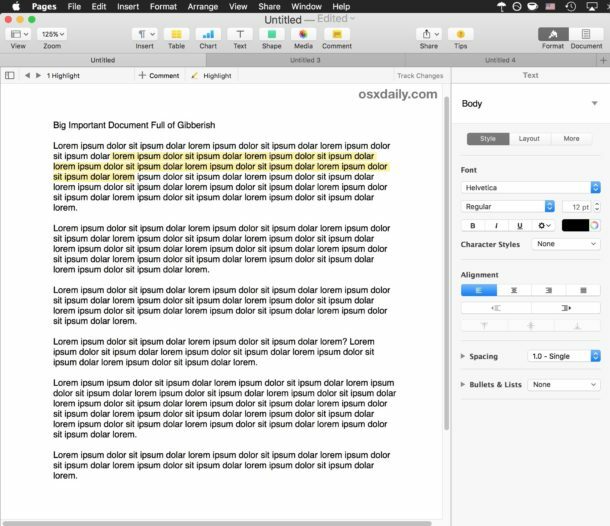 I primarily use TextEdit as well, it’s leaner and quicker than Pages and it works for most of my needs. Pages is good for more complex word processing though, like highlighting. 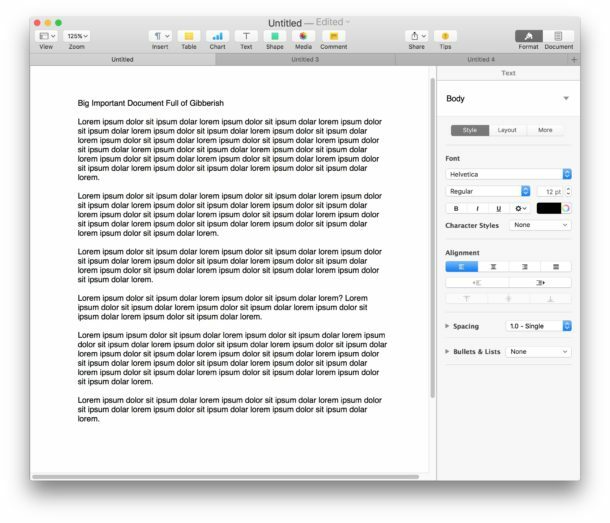 If you want something with a little more features than TextEdit, try Bean, which is based on TextEdit but filled out to be “a small, easy-to-use word processor that is designed to make writing convenient, efficient and comfortable. Bean is lean, fast and uncluttered. It starts up quickly, has a live word count, and is easy on the eyes. Also, Bean is available free of charge. MS Word, OpenOffice, etc. try to be all things to all people, but sometimes you just want the right tool for the job. That is Bean’s niche.” See also Wikipedia article for interesting history. That Bean “is no longer being developed” means only that it won’t become bloatware like so much software does; the developer is continuing to update it for compatibility with latest Mac OS. I set up several character styles by the method described in the ‘Earlier Versions’ section above that used different colors and different keyboard shortcuts. This allows me to highlight in multiple colors very quickly. But when you apply the style, ins’t the style applied to the whole paragraph? Can this be done in Page Layout, Textboxes? I guess I will try it and find out. Well: ”Highlighting is particularly useful for students, writers, editors, educators, and office workers, “— but Pages is NOT. It has gone castratet in the last update from several important necessary points without any reason. Selecting noncontiguous phrases that need to be Bolded or Italicized. For example, a full page of book titles and authors, where the authors names must be Bolded. The “Ink bottle” version of Pages could do this, but no version since then. There is a bold keyboard shortcut too, I think it’s command+B on selected text? Try it. Understand your ‘how to do highlighting’ of Pages document, thank you. However this ‘highlighting’ is not printable. How to do printable ‘highlighting”?